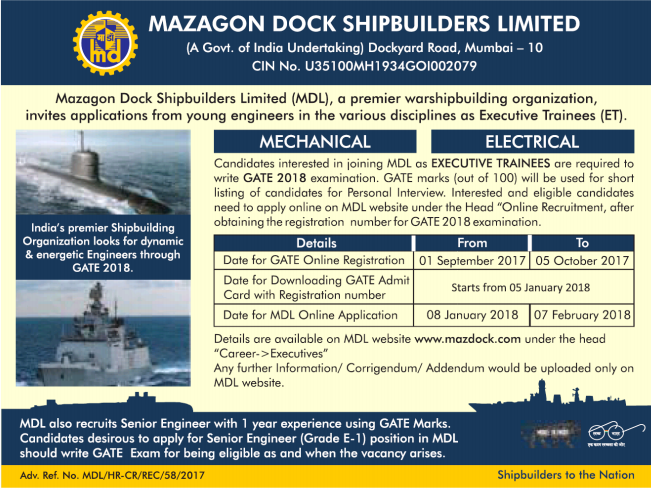 Mazagon Dock Recruitment 2017 for the post of Executive Trainees for Engineering graduates throgh GATE 2018.The detailed eligibility and application process are given in below. University/ Deemed University Or Institute recognized by AICTE. Final year students are also eligible to apply for the post. However, their final selection will be subject to clearing the qualifying requirement as above with minimum First Class or 60% Marks or equivalent. GATE 2017 Examination: The Graduate Engineers from the relevant disciplines mentioned in the Qualifying Requirements, who are desirous of taking up a career with MDL are required to write Graduate Aptitude Test in Engineers (GATE) 2017 examination in the same disciplines. Personal Interview: Based on GATE 2017 marks, candidates will be called for Personal Interview.In order to qualify/pass in Personal Interview, candidates will have to secure minimum 60 marks out of 100. How to apply Mazagon Dock Recruitment? All interested and eligible candidates can apply for this position in online through GATE 2018 Examination.